At Good Clothing Co. in Mashpee, founder Kathryn Hilderbrand (left) reviewed patterns with Aiste Zitnikaite. MASHPEE — On a Tuesday afternoon, sewing machines whir and scissors crunch as six women tear through layers of fabric, making designer dresses, shirts, and jackets. But this workshop is far from the modern centers of clothing manufacturing in Asia and Africa; it’s in a small, nondescript shopping plaza in Mashpee in the summer vacation hub of Cape Cod. Kathryn Hilderbrand, 46, a tailor all her adult life, was inspired to open her Good Clothing Co. after reading about the tragedy in Bangladesh in 2012, when 117 people were killed and more than 200 injured in a clothing factory fire. Good Clothing Co. seamstress Lauren Kirby prepared thread before sewing. “Let’s face it, children and marginalized women make most of your clothes,” she said. Hilderbrand asked herself why clothes couldn’t be made here in Massachusetts. A natural networker, she consulted industry friends, who encouraged her to make the leap. She launched a small indiegogo campaign that raised $20,000 and attracted the attention of clothing collectives and others in the fashion industry. To date, more than 125 designers have expressed interest, many signing on to work with her. With mill town infrastructure, New England once dominated textile manufacturing. But when the Northeast became too expensive, jobs headed south and then overseas. In the United States, the share of apparel consumption made in this country dropped from 50 percent in 1994 to 2.5 percent in 2012, according to the American Apparel and Footwear Association. Hilderbrand said she can turn a profit by the end of the year while manufacturing in the United States by paying her workers piecework rates and bringing on more workers when production ramps up. Being a smaller shop, she can make clothing in runs as large as 500, though the typical range so far is 10 to 90 of a design in each size. New designers without a lot of capital like that her minimum order is much smaller than what the 250 or so that manufacturers in New York’s garment district or overseas will demand. But the turnaround time — four to eight weeks — can be just as quick as those outlets. Good Clothing’s lower upfront costs mean less risk for designers, who can produce a wider range of styles and gauge customer response. And shipping costs, especially for small runs, are much cheaper. Good Clothing is working with a few local brands, from Chatham’s Fisherman’s Daughter, which makes custom women’s apparel, to Harwich-based Cape Cod Beach Chairs, which produces cloth-backed beach chairs. Pieces that Good Clothing Co. made are already for sale in Fisherman’s Daughter’s retail shop. Hilderbrand has also booked work with more far-flung companies, like Alchemy Detroit, which specializes in blazers, tees, and scarves, and La Fille Colette, a specialty clothing outfit out of Boston that launched last fall. Annalies Buckley steamed a shirt at Good Clothing Co.’s Mashpee facility. Scott Nagle, principal of Brohaun, a Cape-based company specializing in board shorts and the fashions of surf and skate culture, is happy to be doing business locally. “We’re looking forward to working with a manufacturer so close,” said Nagle. “I was not happy with samples I had received from China.” He is making beach chairs as well. 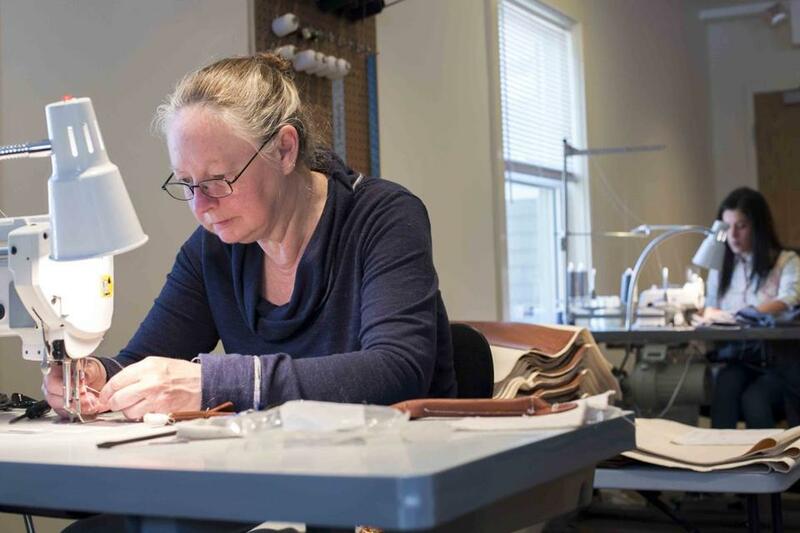 Born in California, Hilderbrand has been a tailor since she was 16, working for other master tailors in Virginia Beach and on Cape Cod before moving to suburban Washington, D.C., in 2004 and starting her own tailoring business. After a few successful years, she was forced out of business when the recession hit. Kathryn Hilderbrand, Good Clothing Co.
She returned to Cape Cod in 2009, where her family was based, and began another tailoring company, called Stitched, as well as an online destination selling her own line of women’s casual clothing, Green Line by K, which uses mainly sustainable, natural, and organic materials and attracts a more conscientious consumer. It sells about 100 garments per month. Hilderbrand’s new venture has been up and running for only a few months, and she is deliberately taking it slow to avoid the pitfalls of overpromising and under delivering. 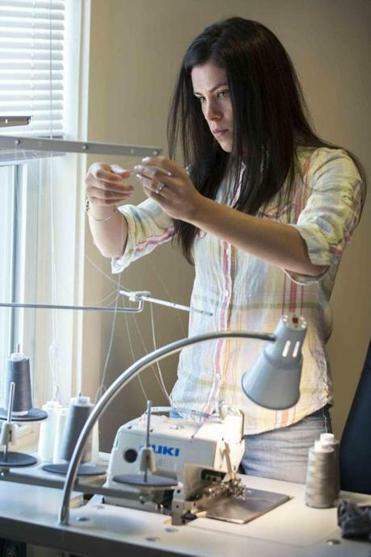 Her goal is to build a strong client base and prove that clothing manufacturing can once again thrive in the United States, and now on Cape Cod. “We’re just stepping back and doing things the way they used to be done,” Hilderbrand said. 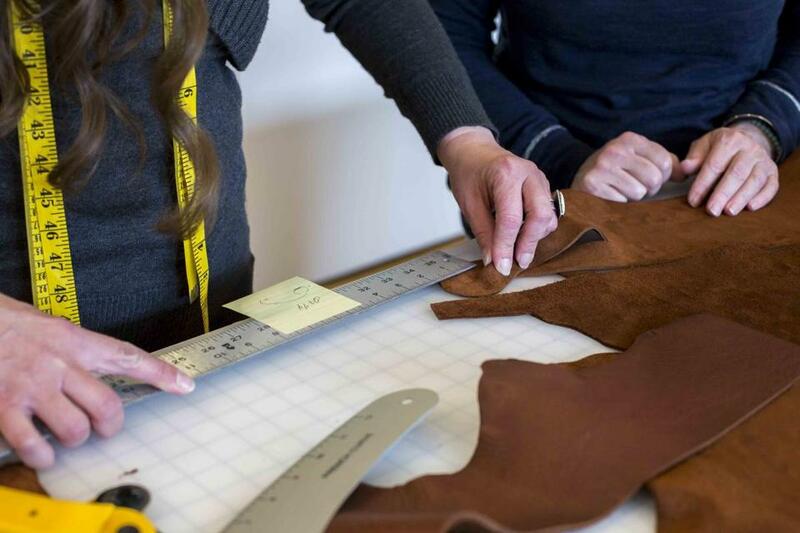 Hildebrand worked with leather during a brainstorming session with business partner Jeanine Duquette. Duquette (left) worked on bags while Kirby sewed yoga shawls.